The technology which can support all different styles of casting. 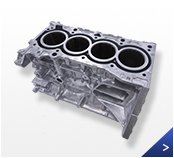 Aluminum alloy casting, a technique to solidify the melted aluminum alloy which is poured into a mold, is capable of making close-to-finished products(near net shape). Hiroshima Aluminum Industry Co.,Ltd. is the only company in the world that furnishes all of these possible casting methods from a single company. Since our founding in 1921, Hiroshima Aluminum Industry CO.,Ltd. has focused intently on technological progress and the development of “products that benefit our customers”. Our domestic and international locations. We put our focus on training the engineers and improving the working environment. © 2015 Hiroshima Aluminum Industry Co., Ltd.
All trademarks and copyrights belong to their respective owners. Reproduction or appropriation of anything from within this site is forbidden.